Red shoes, red pants, orange shirt. 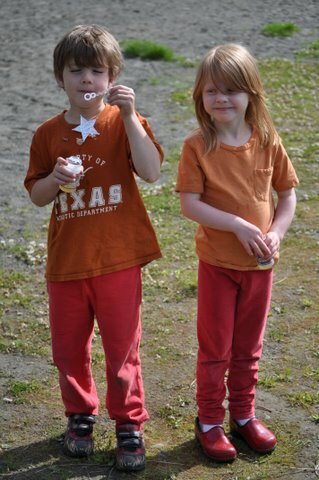 How is it that these two children, from different homes, wound up with nearly the same outfit today? Was it . . .
a) planned days in advance? They discussed their current wardrobe options and made arrangements last Thursday when they saw each other and then stashed away the appropriate items so they would have them ready today. b) planned yesterday? After their parents were in bed they learned how to read, looked up phone numbers, figured out how to use the phone and planned the whole thing unbeknownst to any parental units anywhere? c) a reflection of their mothers’ deep concern with current fashion? The orange / red color combination is very popular with the “going into kindergarten this Fall” crowd. d) sheer coincidence? It just so happens that they both have mothers who would rather do things besides laundry and the only clean clothes either of them could find this morning were these. Clearly the answer is b. They are both brilliant you know.